Our Applicant Tracking software goes above and beyond just recruitment database management and allows you to automate your recruitment process by using a defined workflow. Hiring managers can accept, review, and manage a high volume of resumes and job postings in one single location. Empxtrack ATS also helps you keep track of your social media recruiting efforts to help you find the perfect candidates. Don’t Overlook your Internal Candidates! Publish job postings on your internal career portal, job search sites, social media, third party job boards, and inform staffing partners in an instant. Our recruitment module also archives previously submitted resumes, so that HR managers can keep a track of applicants and inform them if any position ideal for them becomes available. 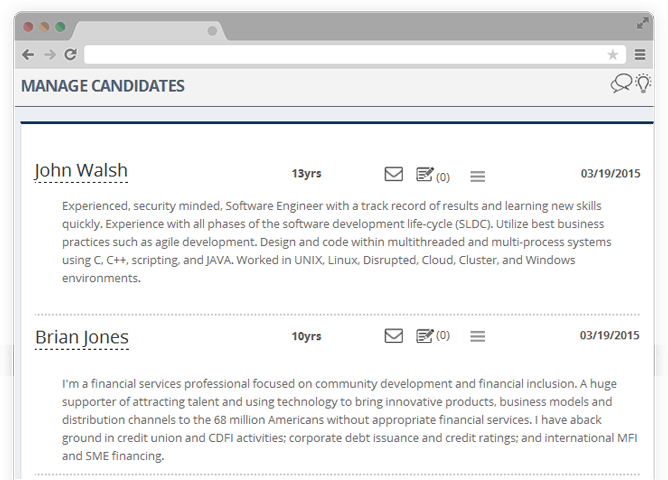 Use our keyword search feature to parse through resumes to find the ideal interviewee. The recruiter can then manage candidate interviews by assigning an interviewer and test coordinator to the shortlisted candidates and send offer letters with the help of our software. Empxtrack Applicant Tracking module is a cloud based system that allows you to manage hiring in your organization with the use of workflows. 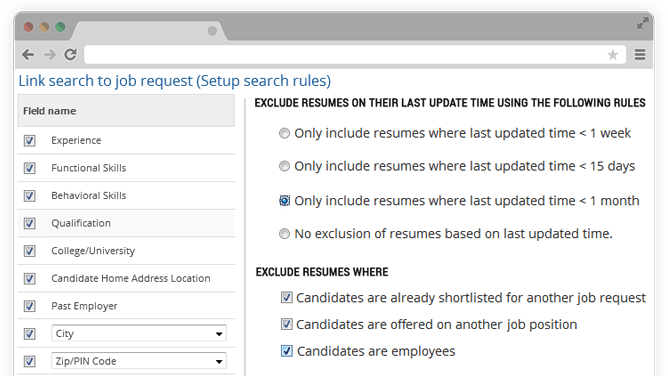 Tracks a wide range of information right from open vacancies, hiring efficiency, time-to-hire, joining date and candidate fit through various dashboards to help you fine tune your recruitment process. Allows candidates to submit their application for multiple vacancies without having to fill out separate application forms for each vacancy. Integrates with LinkedIn login. Posts the vacancy list on the career page of your company. The jobs can be published on multiple job boards and portals automatically. Whether you want to change the fields, setup questionnaires, setup an approval process or integrate with your JD, our ATS provides these options to you on the click of a mouse. We integrate with external resume parsers and have relationships with a leading player to help you parse resumes from various sources. Store notes against candidates for future reference. Further access past interview notes automatically. Schedules events such as written tests and interviews and informs both the interviewer and the candidate. Integrates with your email and calendar application.